HomeAll PostsSkin Care AdviceWHY AND HOW DOES OUR SKIN AGE? Civilisation, medical advances and thankfully, less wars, have all meant that we live much longer lives than our forefathers. However, as we age our skin changes too. We are all aware of wrinkles and skin laxity, but pigmentary changes and skin cancers are also common with ageing. Ageing of the skin can be internal, which is due to genetic reasons or it can be due to sun exposure over our long lives. The latter is preventable as it is due to the avoidable effects of chronic sun exposure over our internal genetic ageing process. Sun damaged skins show deep wrinkles and pigmentary changes whereas genetically determined ageing of the skin is characterised by a pale, smooth texture, fine wrinkles and dryness. 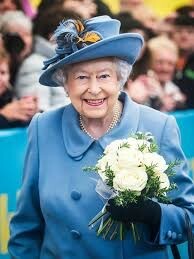 If you need evidence look at a picture of Her Majesty, the Queen! She never holidays on a beach! Her face is a result of summers at Balmoral and a hat! Have a look at this picture! I picked this picture on a google search. The face to the left has aged normally but the face to the right is of a mature sun loving person! Look at the difference and decide for yourself! Our skin is divided into two parts; the epidermis, which is more superficial and the dermis which is the deeper layer of the skin. With normal time related ageing, the cells of our epidermis lose their capacity to grow properly, making the healing of minor injuries very difficult and also making the skin rough dry and itchy and pale. The immunity of our skin also goes down due to loss of special immunity controlling cells, making us prone to diseases and cancers of the skin. The thickness of the dermis decreases by nearly 6% with every passing decade. The skin loses it’s elasticity as the elastin and collagen fibres are damaged and collagen manufacture is reduced. This makes the skin of elderly people thin and friable. The sun adds to the above problems and can cause thickening or thinning of skin. 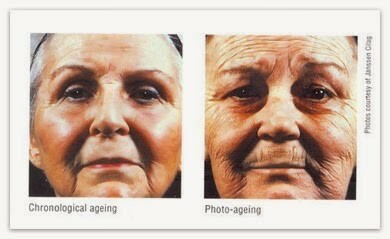 Sunlight and UV rays reduce the collagen supporting scaffold and break down collagen. Furthermore, the oil glands increase in size and give the skin a bumpy appearance. This leads to deep wrinkles, a leathery – bumpy appearance, a fragile and loose skin in most people. In some others, it could make the skin thin and lead to prominence of blood vessels and redness. Occasionally people develop scaly red patches or brown spots. The worst-case scenario, involves the growth of skin cancers, due to a trigger set off by UV rays, which can sometimes be fatal! Commonly known cancers are Basal Cell carcinoma, Squamous Cell Carcinoma and Malignant Melanoma, but there are many more! Finally, we cannot underestimate the role of other lifestyle factors which hasten the onset of ageing and these include smoking, the lack of exercise and an increased caloric intake (especially junk foods and sugary foods). There is some evidence that 3 cups of coffee every day reduces our collagen synthesis. Furthermore, certain drugs such as oestrogen, long-term steroids or thyroxine may increase our signs of ageing.